The Basil Hetzel Award was created to honor the achievements of its founder, Dr. Basil Hetzel, for his work in the field of iodine nutrition. As an advocate of the sustained elimination of IDD from the globe, he recognized that persistent and professional communication of the crucial importance of iodine in the daily diet and the dangers of its absence was essential to create public demand. "The prize can be awarded to a person, persons or entities that have made significant contribution in public education via multiple use of print, electronic or web media in recent years that has significantly furthered awareness and progress toward the sustained elimination of IDD in a country or region." If you know someone who meets these criteria, you can submit your nomination by email. To qualify, the effort must advance the national commitment to universal access to optimal iodine in the daily diet and/or to sustaining that achievement. The award is not restricted to candidates reporting in the media, but may include others communicating this message broadly, even in communities. Established in 2009, the Award is presented every two years. It comprises a cash grant of US $2000, a plaque recording the presentation, and wide international publicity of the event. 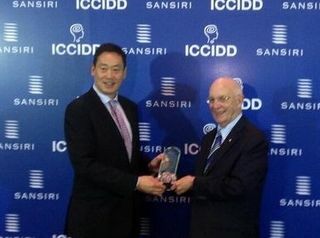 The Award is financed by a special contribution made by Dr. Hetzel from the Pollin Prize awarded to him in 2009 for his career work in his recognition that iodine deficiency can cause brain damage in newborns and for orchestrating an effective global campaign for the eradication of IDD. A founder of ICCIDD almost 30 years ago, Dr. Hetzel has been at the forefront of the global campaign to overcome iodine deficiency and its associated mental impairment. His efforts have firmly established the causal role of iodine deficiency in brain damage to newborns and the importance of iodine nutrition. 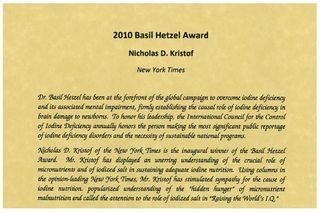 Nick Kristof of New York Times won the first Basil Hetzel Award. The second recipient of the award was Mr. Srettha Thavisin.